Walk into just about any pet store and you're likely to see a shelf full of little plastic containers filled with water and some very beautiful fish -- blue veiltail bettas. The blue veiltail is the most common betta sold in pet stores because it displays very dominant genes for color and finnage. Color in betta fish is expressed through four layers of cells within the fish's skin: the iridescent top layer, the red layer, the black layer and the yellow layer. In a wild betta, none of these layers is more prominent than another. In a blue veiltail, the top layer of cells is more concentrated with iridocytes, or iridescent pigment cells, so these cells appear as a shimmering blue. The fish's genes control how much of each pigmentation is present in each layer of cells, as well as the shape of its tail. A veiltail has a long, flowing tail that droops -- the most common type of tail among non-wild bettas. A veiltail crossed with just about any other tail type will produce veiltailed-offspring, as will that offspring's offspring. This means the veiltail gene is highly dominant. Because little selective breeding is required to produce blue veiltails, they're usually hardy fish -- as long as they come from a pet store or breeder that maintains good breeding practices. A blue veiltail needs clean water and a container of at least 2.5 gallons, but larger enclosures are preferred as long as the fish is provided with hiding places throughout. 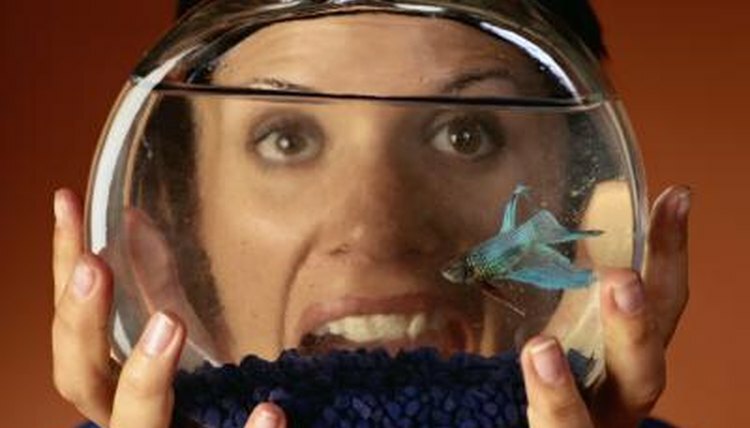 A wide, long aquarium is better than a tall one for a betta, and a covering of some kind is recommended because they're accomplished jumpers. A strong filter isn't recommended because it can damage its delicate fins. Although the betta can tolerate a pH range between 6.0 and 8.0, try to avoid rapid fluctuations in acidity to help keep your fish healthy. Caring for Betta Fish: An Insider's Guide for Betta Lovers; Song, Marcus.